Would you like to travel back in time? Enjoy this online version of A Brief History of the Apalachicola Area by George L. Chapel, Apalachicola Area Historical Society, Inc. Explore the history of Raney House, which was constructed during Apalachicola's days as a thriving cotton port, and is now listed in the National Registry of Historic Homes. Orman House, another of Apalachicola's beautiful historic homes, is now a State Park with tours available. Preserving the history of one of Apalachicola's most prominent citizens, the John Gorrie State Museum is a favorite stop for visitors and locals alike. 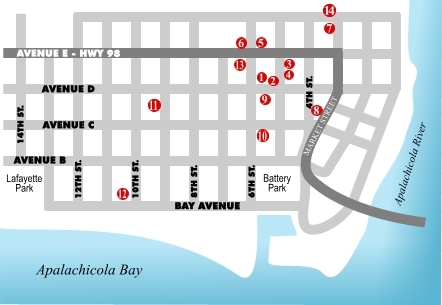 Trinity Episcopal Church's Online Tour of Apalachicola's Historic Homes and Buildings. A profile of Apalachicola High School, preparing students grades seven through twelve for the high tech world of the future.